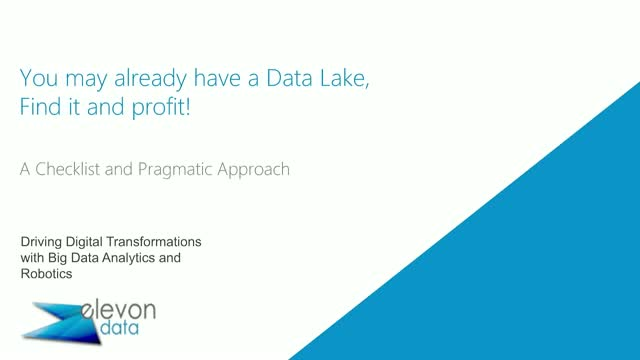 You May Already have a Datalake, Find Out and Profit! You may already have a data lake if you have a Data Warehouse, Operational Data Store or place your source files into a common file folder even if you do not label it that way. By formalizing and supporting a data lake in your information management architecture, you may be able to help some groups in your company deliver analytical and data innovation faster and better. Not everyone benefits from a data lake. This talk is a quick way to stimulate innovation at your company. We will also talk about about Amazon and Azure data lake capabilities. Here are some simple checklists to see if a data lake benefits you and ideas to ramp up your data lake efforts. •Checklist to evaluate if you already have a datalake. •How to formalize a datalake if already have one. Elevondata is a next generation global data services and solutions company offering compelling data management, reporting, and analytic services using agile and adaptive big data techniques with a simplified, unique and personal customer experience, helping clients achieve their data management and overall business goals. Title: You May Already have a Datalake, Find Out and Profit!